My son was bugging me for cookies tonight. He's almost 3 so I expect it. The only problem is that we didn't have any cookies. I very rarely buy them because I don't usually keep sweets like that around. I ended up finding some that my dad bought for him, but well, those weren't good enough - he wanted to make some. That's never happened before! I always ask him if he wants to help in the kitchen, and he'll do a few little things here and there, but he's never taken the initiative before. It was proud moment for this mommy. And how could I resist his adorable, whiny face? I don't really have any of my own cookie recipes so I searched one of my favorite sources: allrecipes.com. I found a butter cookie recipe that looked pretty good and had good reviews so I thought I'd give it a try. I added a little extra sugar like some of the reviewers did and they turned out great. Some also used vanilla extract instead of the almond, but I'm a sucker for anything with almond extract. It was easy to put together and by using cookie-cutters, my little guy got his hands dirty and got to be part of the baking action. Because the original recipe makes a few dozen, I only cooked up a third of the batch and will save the rest for a later use. I also didn't frost ours because they're good just as they are, but these would be great with some icing to compliment the upcoming holiday season! 1. Cream butter until lightened in color. 2. Add sugar and beat together until fluffy. 3. Add egg and almond extract and mix well. 4. Gradually add flour, mixing after each addition. 5. Form dough into ball, wrap in plastic wrap and chill for at least 1 hour. 7. Roll out dough onto lightly floured surface to 1/8 inch thickness. 8. 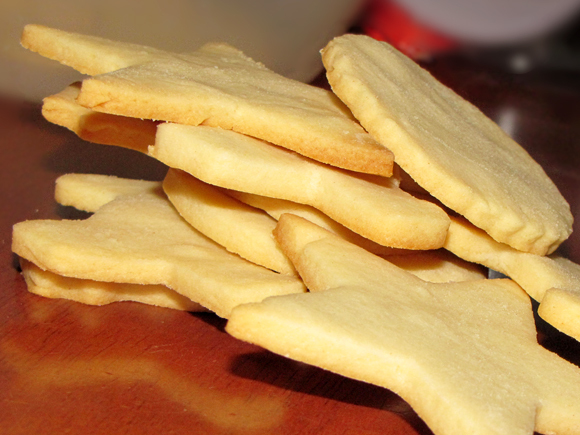 Use lightly floured cookie-cutters to get desired shapes and place onto non-stick cookie sheet. 9. Cook for 10-12 minutes or until golden. 10. Cool completely on wire rack. yum! we're doing a cookie baking day this weekend and i really want to try this one! How easy!! !